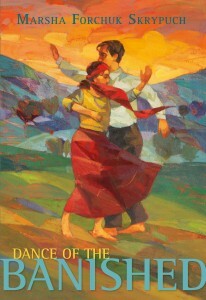 Dance of the Banished is an evocative title suggesting a novel about exile, punishment, and isolation. But it is also a love story about two Alevi Kurd young people separated by war, and isolated from their culture. Divided by an ocean, Ali and Zeynep long to be together. Their dreams are similar to those of any young couple. They desire the freedom to make a safe home for themselves, and to practice their religion, and honour their culture without fear of persecution. Meticulously researched and sensitively written by award-winning author Marsha Forchuk Skrypuch, Ali and Zeynep take us on their journey that begins in the months prior to World War 1. In 1913 Anatolia, a young couple, Ali and Zeynep, dream of building a new life in Canada together. But when Ali suddenly finds passage to Canada for his brother and himself, he must leave his fiancée, Zeynep, behind. He promises to send for her when he has earned enough money for her passage. Zeynep, angry at being left behind, tells Ali she refuses to wait for him, but before he leaves, she gives him an evil eye necklace for protection. Ali presents Zeynep a journal to write in, encouraging her to record her life and thoughts until they can be together again. He has a matching journal, and promises to do the same. It is through the diaries of Ali and Zeynep that the story is told. Through their writing in their journals, each tells the other about their experiences and thoughts. Through Zeynep’s journal, we learn about her frustration and disappointment when Ali breaks his promise and leaves her behind. And to make matters worse, she suspects Ali’s mother orchestrated his sudden departure. But Zeynep refuses to give up her dream of finding better opportunities, and follows visiting Christian missionaries to a nearby city in hopes of improving her life and obtaining an education. Zeynep’s observations about Western customs give us insight into the Alevi culture. For example, she puzzles that the house has many rooms, and separate rooms for people to sleep in and that one room is used for eating only when company come to visit. Zeynep quickly becomes accustomed to her new surroundings, and helps the missionaries at the hospital. Soon, Europe is on the brink of World War 1, and the Ottoman Army marches through village after village in Anatolia, leaving behind destruction and death. Zeynep is horrified when the Young Turks start to kill people who are non-Turks, specifically the Alevis and the Armenians. Young men are forced into the army, and non-compliance with conscription means death. Zeynep realizes that Ali is safer in Canada. Alevis and Armenians fear for their lives, and escape into the mountains enduring cold and thirst and starvation. With the encouragement of the American consul, Leslie Davis, she becomes an important eyewitness to these events since she is a non-Christian. He encourages Zeynep to continue to write in Zaza, and even provides her with special thick paper, and a selection of pens. On the other side of the ocean, Canada is at war with the Ottoman Empire, Germany and Austria. Ali has found a job in Brantford, Ontario, but when World War I erupts, all foreigners are let go for “patriotic reasons.” Ali futilely tries to explain that he is an Alevi Kurd, and no friend of the Turks. But everyone assumes because he is from Turkey, he is a Turk. Ali and his brother are sent away to Kapuskasing, Ontario to work in a internment camp cutting down trees, an act which causes Ali much grief since felling trees is forbidden in the Alevi religion. In their separate journals, Zeynep and Ali both express a desire to dance the semah with each other again. We feel their longing to perform the ritual Alevi dance-prayer which is danced by six couples, both men and women, side by side. Ali pictures Zeynep’s red head scarf swirling, and Zeynep yearns to be with Ali again. The memory of their last dance together sustains them both as they ponder their choices in virtually hopeless situations. Through the diaries of Ali and Zeynep, we experience the horrors of war, the injustice of exile, and their love for each other and their culture. They seek a better life, but are thwarted by the outbreak of war, and circumstances where they are forced to fight for their lives, their love, and their culture. How will Zeynep get to Canada when it is at war with Turkey? The dedication for Dance of the Banished reads “For the forgotten ones.” In her nineteenth book, Marsha Forchuk Skrypuch again gives a revealing and compassionate voice to an under-represented group of people, and shines a light on little-known events in history. Writing about historical injustices for young adults requires a solid grip of the events, sensitivity, and the ability to juggle multiple perspectives in order to create a compelling story that not only keeps us turning the pages, but also brings forward truths that may have been forgotten or buried. Dance of the Banished enlightens us about the plight of the Alevi Kurds during World War 1, saddens us as we find out about the massacre of the Armenians, and maybe even embarrasses us as we discover how “foreigners” were treated in Ontario. Her characters are human, and multifaceted, and make us think about how we would react in times of great stress if our homeland, families, or loved ones were in danger. The answers are never easy, and Marsha does not shy away from difficult and heart-wrenching choices. 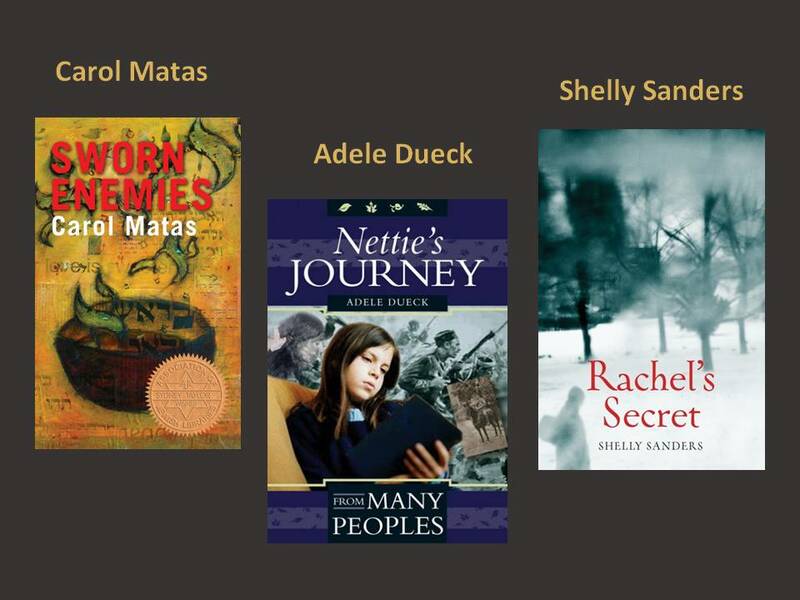 Marsha has received numerous awards and honours for her picture books and young adult novels, including a nomination for the Canadian Library Association Book of the Year in 2007. Marsha has penned the bestselling Dear Canada book, Prisoners in the Promised Land. She has written about the Ukrainian Holodomyr, the Armenian genocide, and the Vietnamese war orphans (One Step at a Time, The Last Airlift). Her most recent books are about Ukrainians in World War II (Underground Soldier, Making Bombs for Hitler, Stolen Child). Visit Marsha at www.calla2.com for a complete list of her books and her blog. This entry was posted in Alevi Kurds, Authors, Book review, Books, dance of the banished, Historical Fiction, History, marsha forchuk skrypuch, world war 1 on September 3, 2014 by Urve Tamberg. Some authors don’t like book signings in bookstores. There have been reported cases of an author assigned a table by the entrance, their books plunked on that table, and the author then waits with pen in hand – ready to sign books for the crowd. And waits. And waits. Fortunately, that didn’t happen to me in Sarasota due to the efforts of Monika – organizer and Estonian extraordinaire. 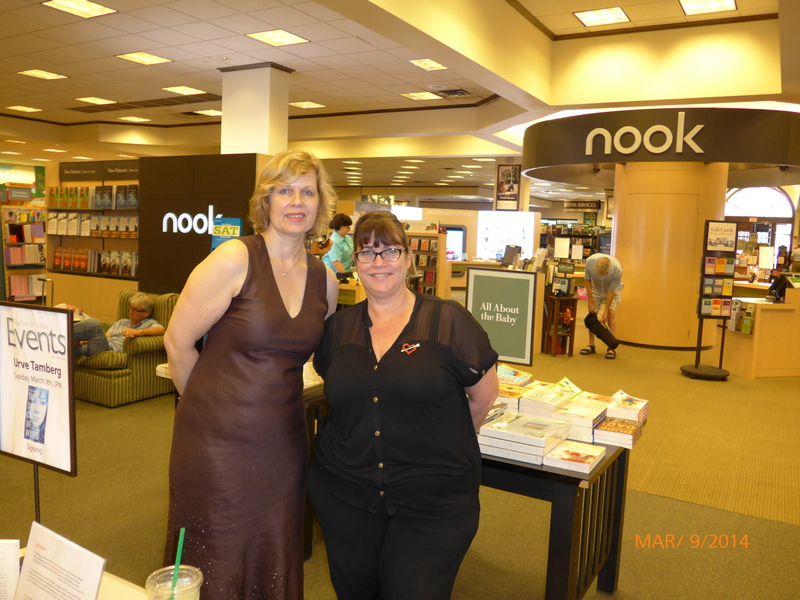 It was my first book signing in the USA, and Donna, from Barnes and Noble, was fantastic. It was a pleasure to meet a book lover who is involved in the community, and engaged with schools, librarians, and teachers. I was delighted to meet the small, but enthusiastic group of Estonians. Given the events in Crimea – the establishment of military presence, a vote to join Russia, and the inability of the West to intervene – all very familiar events to the Baltic countries – it was timely to talk about The Darkest Corner of the World. In turn, some of the audience shared their stories and experiences of the war, and their thoughts about the current situation in Ukraine. Thanks everyone! It was great to meet you! 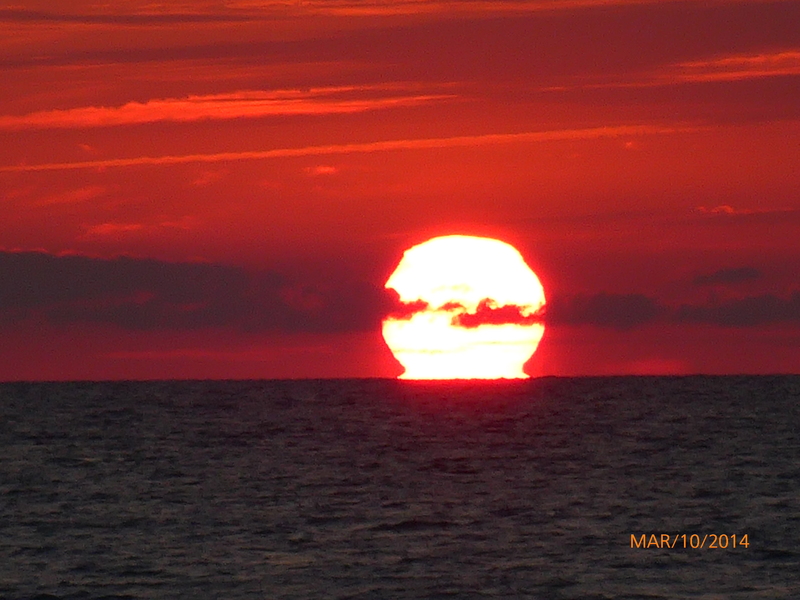 And being in Florida, the sunset was pretty spectacular as well. 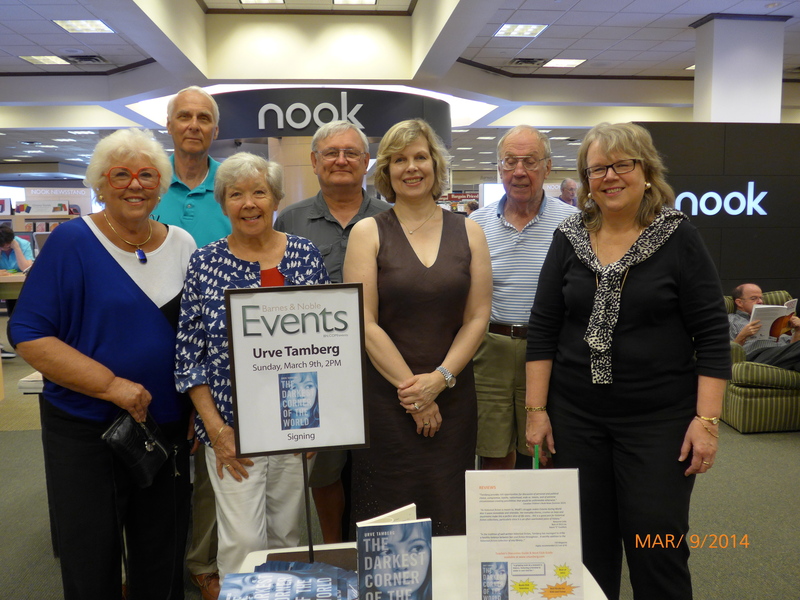 This entry was posted in Authors, Books, Estonia, Events, Historical Fiction, Marketing, People, Uncategorized and tagged Barnes & Noble, Book signing, Estonia, Sarasota on March 18, 2014 by Urve Tamberg. Who writes about Stalin and communism for kids? Like most of you, I’ve been watching the Olympic coverage from Sochi. Along with the commentary about the Olympic athletes, I’ve also heard snippets of history – some of it accurate, some of it not. One particular comment from an NBC commentator who referred to decades of Soviet communism as a “pivotal experiment” astounded me. We know about Hitler and the horrors of the Holocaust. But what about Stalin and his crimes against humanity? He ruled the Soviet Union for thirty brutal and bloody years. Where are the stories about the millions of people who died during his rule and World War II? Where are the stories about life behind the Iron Curtain? No people means no stories. No memories. Winston Churchill said, “History is written by the victors.” For most of the twentieth century, the Soviet Union was the “winner.” For five decades the Iron Curtain limited communication between the West and the Eastern Bloc countries. Letters were censored, and people were afraid to tell their stories. As the child of immigrant parents from Estonia, I grew up hearing about arrests, deportations, imprisonments in labour camps, and other grim events. At that time, there was virtually nothing written about these events. So many years later, I wrote the book I wanted to read as a teenager (The Darkest Corner of the World), and continue to write about little-known events. I polled authors from CANSCAIP and SCBWI Canada East and Canada West. Not many. Far too few. There are still so many stories to tell. 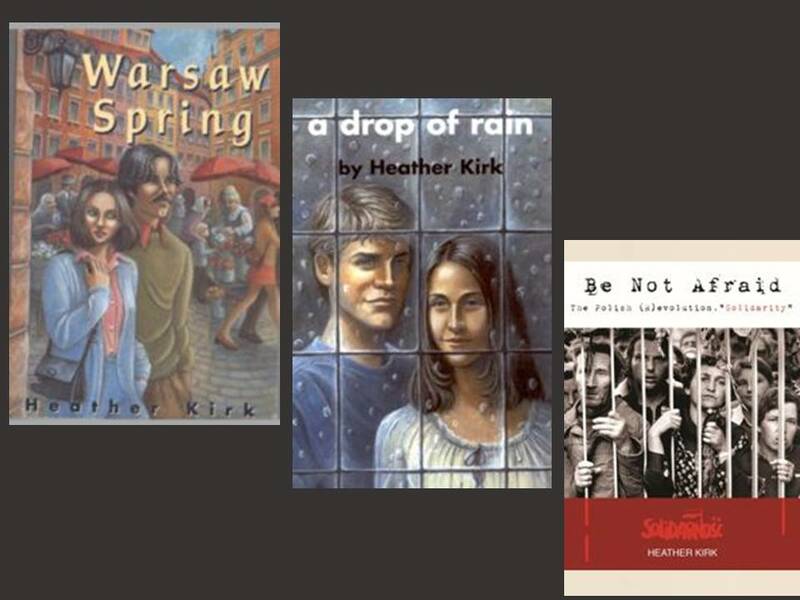 Here is the list of Canadian Kidlit authors, and their books set in the former USSR countries, as well as books about Russian history. If you know of any books I’ve missed, I’d love to add them to the list. 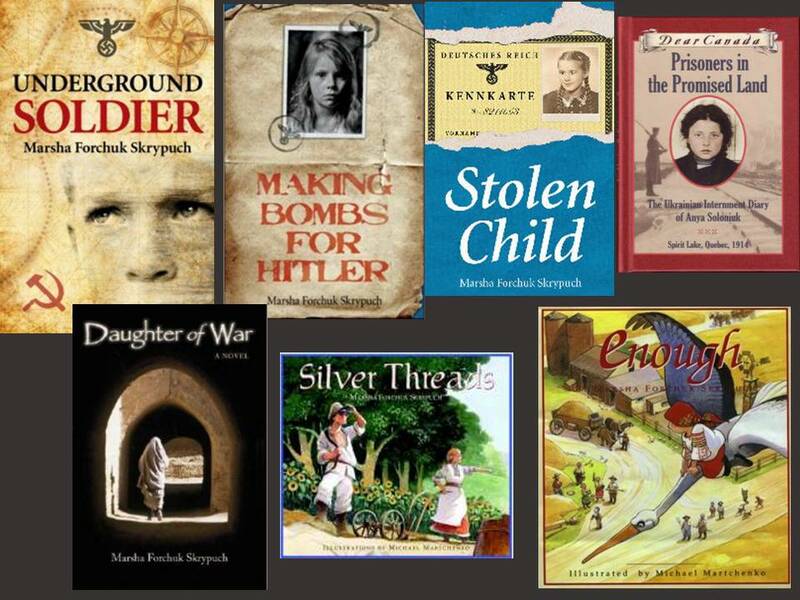 Marsha Skrypuch is a Ukrainian Canadian children’s writer who has received numerous awards and honours for her books. Her most recent novel is Underground Soldier. Luka escapes a Nazi slave camp only to be caught amidst the Nazi and Soviet front. He joins Ukrainian resistance fighters and mounts raids on both oppressive regimes. Graffiti Knight by Karen Bass. In spite of the scars World War Two has left on his hometown, Leipzig, and in spite of the oppressive new Soviet regime, Wilm is finding his own voice. The Secret of the Village Fool by Rebecca Upjohn. (picture book) When the Nazis arrive in the sleepy little village of Zborów in Poland and begin rounding up Jews, what will Milek, his brother Munio and their parents do? 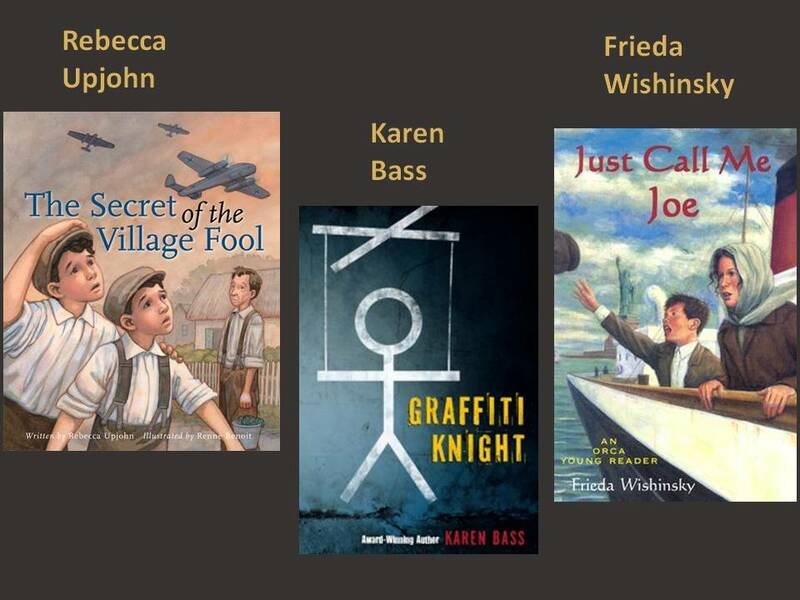 Just Call Me Joe by Frieda Wishinsky. The year is 1909 and Joseph has just immigrated to the United States from Russia. Sworn Enemies by Carol Matas. Set in Czarist Russia in 1851, this novel addresses the issue of forced conscription into the army. Nettie’s Journey by Adele Dueck. An old woman tells her granddaughter the story of her life in a Mennonite village in Ukraine – from the dangers of World War I and the Russian Revolution to their escape to Canada. Rachel’s Secret by Shelly Sanders. Rachel, a Jew, and Sergei, a Christian, find their worlds torn apart by violence in pre-revolutionary Russia. Schooldays Around the World (available 2015) by Margriet Ruurs. (picture book) A school in Kazakhstan is featured. Out of Line: Growing up Soviet by Tina Grimberg. (Non-fiction) Memories of life behind the Iron Curtain in Kiev. 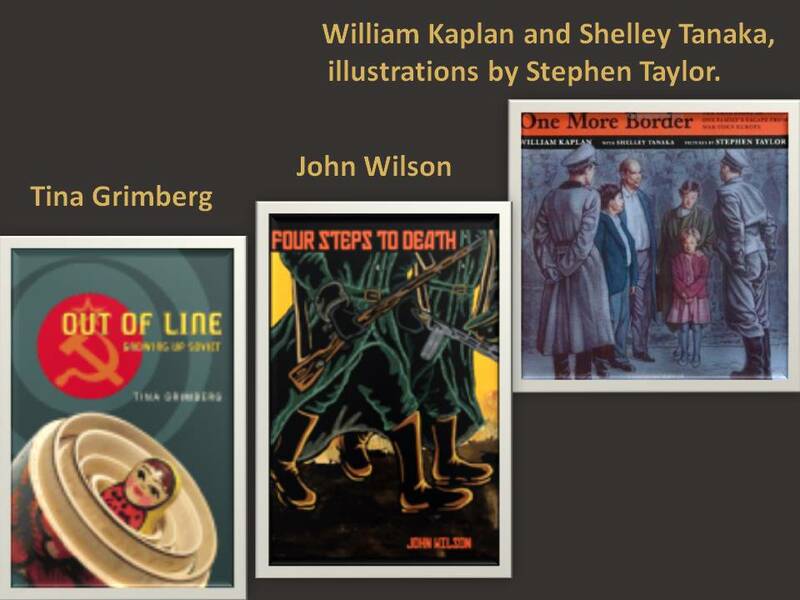 One More Border: The true story of one family’s escape from war-torn Europe by William Kaplan and Shelley Tanaka, illustrations by Stephen Taylor. (Non-fiction) Lithuanian Jews escape the Holocaust. Four Steps to Death by John Wilson. Set during the battle of Stalingrad. This entry was posted in Authors, Books, Historical Fiction, Kidlit, Sochi, Soviet Union, Stalin and tagged Estonia, Russia, Soviet communism, Soviet Union, Stalin on February 13, 2014 by Urve Tamberg. 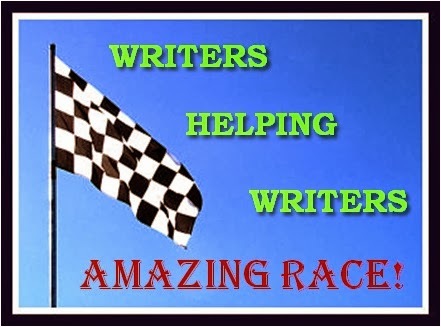 Don’t Miss The Writers Helping Writers AMAZING RACE! Writing is hard, isn’t it? Create the perfect hook. Make your first page compelling. Craft an amazing 25 word pitch. Knock out a query that will blow an agent’s mind. On and on it goes. And sometimes, well, you just wish someone would help. From October 21st until October 27th, Writers Helping Writers is posting an OPEN CALL for writers. You can fill out a form, requesting help with critiques, book visibility, social media sharing, blog diagnostics, advice and more. An army of Amazing Racers are standing by (ME INCLUDED!) waiting to help with your submissions. How many people can we help in a week? Let’s find out! Did I mention there are Celebrity Racers too–amazing authors and editors who know their way around a first page. Maybe one of them will pick your submission to help with! Each day this week, there’s an AMAZING giveaway, too. So stop in at Angela & Becca’s new Writers Helping Writers website and find out how to take advantage of this unique, pay-it-forward event for writers. I’ll see you there! This entry was posted in Writing on October 21, 2013 by Urve Tamberg. Elaine and I met a few years ago in one of Brian Henry’s writing courses, and I’m delighted to interview her about her new historical novel, The Loyalist’s Wife. She welcomes everyone to the official launch on Saturday, October 6th from 2-4pm at the Quality Inn, Woodstock. Thanks to Elaine for taking the time to share some great advice about writing historical fiction, and self-publishing. When American colonists resort to war against Britain and her colonial attitudes, a young couple caught in the crossfire must find a way to survive. Pioneers in the wilds of New York State, John and Lucy face a bitter separation and the fear of losing everything, even their lives, when he joins Butler’s Rangers to fight for the King and leaves her to care for their isolated farm. As the war in the Americas ramps up, ruffians roam the colonies looking to snap up Loyalist land. Alone, pregnant, and fearing John is dead, Lucy must fight with every weapon she has. With vivid scenes of desperation, heroism, and personal angst, Elaine Cougler takes us back to the beginnings of one great country and the planting of Loyalist seeds for another. The Loyalist’s Wife transcends the fighting between nations to show us the individual cost of such battles. What inspired this story and these characters? Do you have a personal connection with this story? The Loyalist’s Wife came about because I wanted to write something more substantial than the family stories and recipe books I had written. I said as much to my soul-mate son, who talked about my qualifications and ended with, “If not now, when?” Indeed. The next week on holiday in Hilton Head, I bought a book, “How to Write Your Novel” and away I went. Following its suggestion to pick a topic about which I was passionate, I chose the Loyalists in the American Revolutionary War. One of Butlers Rangers was named John Garner and so is my brother so that just seemed to be the right name for my male lead. His wife became Lucinda or Lucy after my great aunt. I loved the historical quality of the name and the fact that I could delve into her buoyant personality with the short form. My personal connection is that I come from these Loyalist folks and writing and learning about them has been a voyage of discovery in very many ways. What advice would you give to authors who write historical fiction? There are so many excellent historical fiction writers that I hesitate to give advice. Perhaps that is the advice: read excellent writers in the genre. I have many favorites such as Colleen McCullough, Margaret George, Sharon Kay Penman, Edward Rutherfurd, Anne Easter Smith, Diana Gabaldon—the list is far too long to complete. Do you have other projects in the works? The Loyalist’s Luck is well underway just now and I hope to have it finished at the end of this winter, ready for final revision with a publication date of June, 2014. This is the second in The Loyalist Trilogy with the third, The Loyalist Legacy, slated for June, 2015, completing that series. Then there is a memoir floating around my brain which would build on a lot the family stories I’ve already worked on. Shaping them into an actual memoir for the public will be a labour of love with emphasis on labour. This project has already suggested a number of problems I’ll have to solve so I leave it in the future, out there, waiting until I’m ready to tackle it. And now questions about the business side of publishing. Marketing any novel is a challenge, but a self-published book has unique challenges. What have been your most effective marketing tactics to date? This is a tricky question as it’s too early in the game to know how effective some of my thrusts have been. I chose to self-publish for a lot of very good, well-considered reasons and, so far, I am delighted with my decision. I have control. Perhaps that is the greatest advantage I’ve found so far. I decide on the cover designer (she’s wonderful, lives in Victoria), the interior designer (again wonderful, lives in Paris, France), and the final thrust of the story itself(professionally edited twice). Along the way I’ve been given much advice by those in writing circles and in the business. What I finally learned was that I had to trust my own intuition and write, with the study and knowledge I have, the best book I could. And I had to learn to trust my judgment, born of a lifetime of reading historical fiction’s greatest authors. As far as marketing, The Loyalist’s Wife is on Amazon, both in print and Kindle e-book, and on Kobo as that format is very popular in Canada. I intend to do more formats soon but Kindle is such a universal choice among readers that I found it a good place to start. Having print books with me at all times has proven to be a successful marketing strategy as people, friends and strangers alike, get a special look on their face when they learn I am an author. I’ve sold at a garage sale, local book store, women’s club meetings, speaking engagements, book club visits—you name it, I’ve been there. Because I love people the signings are a joy. I guess you could say that love of people has opened a lot of doors for me. One of the keys to a successful marketing campaign is to identify and target your audience(s). How have you connected, or plan to connect with your “ideal reader?” What advice do you have for writers about finding and communicating with their target audience? What a great question, Urve! The usual audience touted for historical fiction is middle-aged women and I believe that to be true. I do not, however, limit my queries to that segment as I know many men who love HF. I even had a neighbor shout at me from his doorway at 7:00 o’clock in the morning so that he could stop me and tell me how delighted he was with my book. And this man is a reader. Nevertheless, with women in mind, I am looking at various women’s groups and book clubs on the local front and am moving toward expanding that thrust with wide-reaching speaking and reading engagements. Already I am speaking at a historical society and a men’s club, both of which will, I hope!, like the historical quality of the book and the fact that it is written giving equal time to John’s story and to Lucy’s story. The very makeup of the book, with the two stories intertwined, appeals to both men and women. Advice? Look at your story, define your target audience, and look for the places online and off where large numbers of that audience congregate. Go there, too. Goodreads is a great medium for writers, but can be confusing (at least for this writer). What is your experience with Goodreads? Any advice to writers who want to self-publish their novel? Self-publishing is not a way to skip the necessary steps to writing the best book possible. Realize that you need fresh eyes on your work, you need to do enough courses and critique groups to be able to decide for yourself what to keep and what to dump, and you need to have the goal in mind. Mine has always been to have work of which I can be proud, both for myself and for my family. Ask yourself if that version is the best it can be? Would you want to leave it to your grandchildren as an example of your very best work? Some day they won’t have you. Will your books be the legacy you want them to have? A native of Southern Ontario, Elaine taught high school and with her husband raised two children until she finally had time to pursue her writing career. She loves to research both family history and history in general for the stories of real people that emanate from the dusty pages. These days writing is Elaine’s pleasure and her obsession. Telling the stories of Loyalists caught in the American Revolutionary War is very natural as her personal roots are thoroughly enmeshed in that struggle, out of which arose both Canada and the United States. This entry was posted in Historical Fiction, Marketing, Uncategorized, Writing on October 2, 2013 by Urve Tamberg. There are so many phrases related to breathing. We catch our breath. We gasp for air. We mutter under our breath. We hold our breath with anticipation. We refer to something as a “breath of fresh air.” We’re so busy that we don’t have time to catch our breath. I can’t catch my breath. But what if this last phrase were true? I want to share a story with you. A friend’s husband is waiting for a new set of lungs, and she wants to raise awareness for organ donation. Tonight, CBC will run an interview with her at at 5:30 and 11:00pm. I realize that deciding to become an organ donor is a very personal decision, and I’m sure you’ve thought about it. Maybe you’ve signed the back of your driver’s lisence, or maybe you’ve registered with a provincial or state organ donor registry. But in case you are sitting on the fence, you might be interested in Sarah and Keith’s story. This entry was posted in People and tagged lungs, organ donation on January 23, 2013 by Urve Tamberg. I’m sure that you ask yourself this question all the time. No? Well, just in case you’re wondering how to make an author happy, I’ll tell you. Invite them to a book club meeting. Ask them questions about their book, and let them talk. And talk. And talk. Serve them wine, a delicious lunch, coffee and dessert. Share your stories, opinions, and thoughts (best part of the meeting). Thanks to the ladies of The Barrie Book Club, and the ladies of Kleinberg who joined them today. 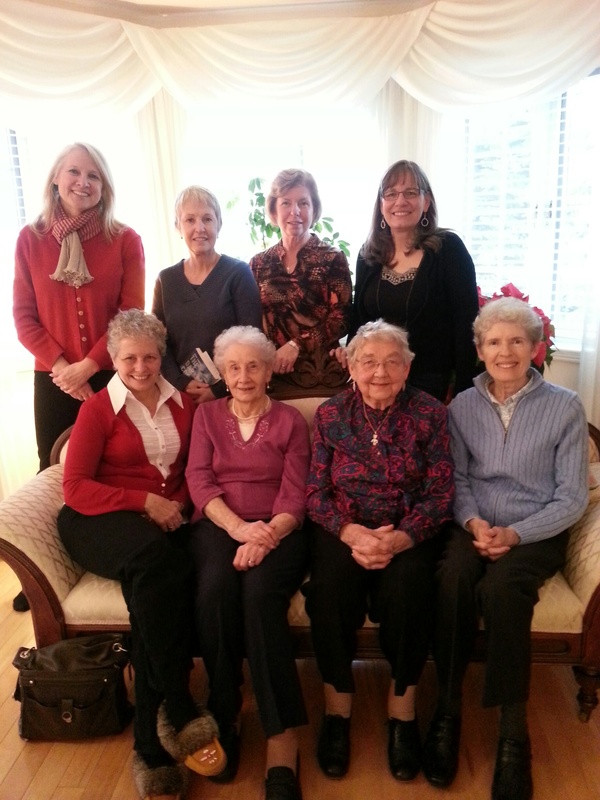 I’m sure there is more than one book club in Barrie, but none can be more fun than these ladies. Thanks so much for inviting me, and sharing your stories. 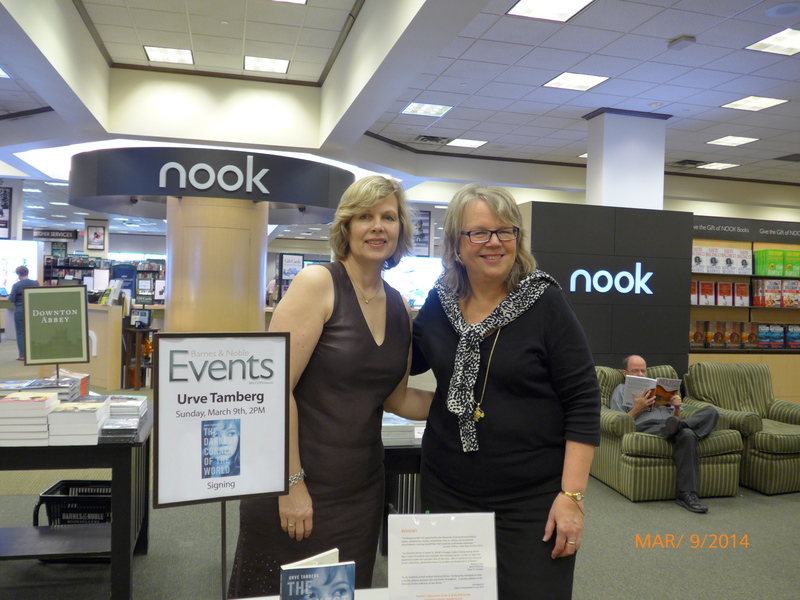 This entry was posted in Book Club, People and tagged Barrie, book club on January 19, 2013 by Urve Tamberg. “In the tradition of well-written historical fiction, Tamberg has managed to strike a healthy balance between fact and fiction throughout… A worthy addition to the historical fiction collection of any library..“ CM Magazine: Highly recommended (3.5 out of 4).